The project consisted of widening one mile of the existing two-lane roadway section with open ditches to a three-lane roadway with dedicated left turn lanes, curb and gutter with planted raised medians, and a closed drainage system. 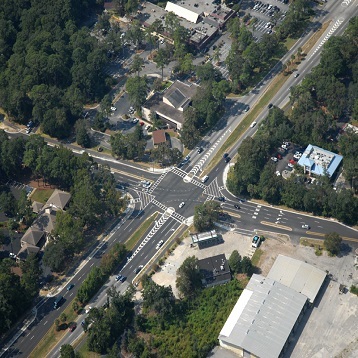 Mathews Drive intersects US 278, the highest capacity roadway on Hilton Head Island. ICE was responsible for coordinating all utility relocations and provided all utility companies with relocation plans with a two-month window to relocate their facilities prior to the contractor mobilizing to the site. ICE was also responsible for performing a constructability review on the original design and assisted the Town in obtaining the SCDOT encroachment permit. A full redesign of the project was provided saving the Town over $750,000 with a Value Engineering concept that was approved and implemented. ICE provided construction management and all inspection related services including material sampling and testing for the entire project. Additionally, all quality control and quality assurance measures were performed as necessary to ensure the project was built in accordance with the plans, specifications, and contract documents. This project included the improvements to one mile of Mathews Drive and intersection of US 278.